“Musser Maestro Marimba Metron” or “Rhythm Machine” was an early ancestor of the drum machine invented by marimba virtuoso and band leader Clair Omar Musser sometime after 1949. The instrument was an analogue percussion sequencer designed to accompany Musser’s marimba performances and to teach rhythm to his students at Northwestern University and in his music room at Studio City, California. 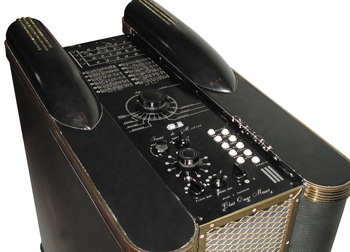 The Rhythm machine was a hybrid electronic and electro-acoustic instrument built into an art-deco styled wooden box 18″ wide, 34″ deep, 32″ tall with a top control panel of switches, buttons and dials. The sound was generated using vacuum tube oscillators plus a set of ‘real’ cymbals that were struck with an electro-magnetic solenoid. The Marimba Metron was able to re-play 13 electronically generated “tempi figures” – rhythmic accompaniments – such as the bolero, waltz, rhumba, cha-cha, tango, samba, and beguine. In addition to the pre-set loops, percussion sounds could be activated using push-button controls. Sounds included bass drum, tom-toms, temple blocks, woodblock, claves, and maracas sounds, along with the two real cymbals struck by the electronic solenoid. was a marimba virtuoso, a conductor and promoter of marimba orchestras, a composer, a teacher, a designer of keyboard percussion instruments, an inventor, and an engineer for Hughes Aircraft. Musser was born in Pennsylvania and began to study the xylophone in the 5th grade. Upon witnessing a performance of Teddy Brown playing marimba with the Earl Fuller’s Rector Novelty Orchestra, Musser was inspired to study with Brown’s former teacher, Philip Rosenweig. Musser soon became recognized as a virtuoso in his own right, performing as a soloist, with orchestras, and in an early Warner Bros. Vitaphone film.